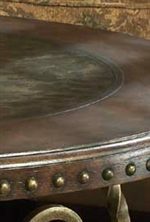 Embellish your home with a cocktail table beautifully designed with brass nailhead trim and brass detailing feet. The elegance and richness of the Old World design will decorate your home with intricate detail and bold accents. The dark stained frame top features etched metal accents, creating a beautiful contrast. 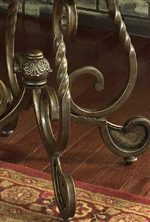 The square metal legs are finished with twisted detail and curved effect. All the details flow together to create an intricate yet bold composition perfect for a home with any decor. Center your living room or family room with the poise and refinement of this immaculate cocktail table. The Rafferty Round Cocktail Table With Metal Top And Metal Legs by Signature Design by Ashley at Beck's Furniture in the Sacramento, Rancho Cordova, Roseville, California area. Product availability may vary. Contact us for the most current availability on this product. 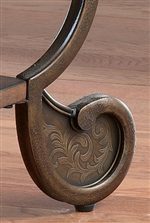 The Rafferty collection is a great option if you are looking for Traditional furniture in the Sacramento, Rancho Cordova, Roseville, California area.